What is a VSP Insurance Plan? VSP stands for Vision Service Plan and is the nation’s largest and top-rated vision insurance company. You can be enrolled in VSP through work or independently. VSP provides individual plans and family plans, with plans starting from around $17 a month. You can obtain a membership card through the VSP website, and see list of benefits. Even without an ID card, you can schedule an appointment with us in Ventura CA, as we are a VSP network doctor. With VSP plans you can save money on eye exams and contact lens exams. There are also many eyeglass frames that are covered in the plan. Based on your plan, you can choose eyeglasses or contacts. In some VSP plans, you may be able to purchase a backup pair of glasses as well as contact lenses. Other services that are often covered by VSP insurance are photochromatic lenses, anti-reflective lens coating, shatter resistant lenses, and single vision lenses. It is recommended to go for an eye exam every year, and never have a gap of more than 2 years between exams. For kids, have their eyes checked at 6 months, then between 2 and 3 years of age, and thereafter, have regular annual eye exams. If you have a family history of eye issues, our Ventura eye doctor may recommend more frequent eye exams. What Happens During an Eye Exam? Irrespective of whether you currently wear glasses or face any problems with your vision, you and your family should go for regular annual eye check-ups. In an eye exam, the eye doctor will examine your eyes with the application of dilating drops if necessary. Check for early signs of other health conditions like diabetes and high blood pressure. If you wear contacts or are considering to start using them, you need to go for an additional contact lens exam. During a contact lens exam, your Ventura eye doctor will perform some tests to ensure you will be comfortable wearing contact lenses. He may go for a tear film test to see if your eyes produce enough tears and make wearing contacts comfortable. If you are a good candidate for contact lenses, your optometrist will conduct tests to measure your eye surface. From the results, he can prescribe the correct sized contact lenses and a suitable type of contact lenses. As contacts are worn directly on the surface of your eyes compared to spectacle lenses which are spaced at around 12 mm from the surface of the eyes, the prescription strength for contacts is different from your regular glasses prescription. With the contact lens exam, your doctor will be able to give you a proper prescription for contacts. After getting the right prescription, you can decide what type of contact lenses best suit your needs. 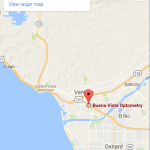 Our Ventura, California practice carries the latest contacts from all the main manufacturers such as Bausch and Lomb, Cooper Vision, Acuvue, and Alcon. Our selection includes soft daily disposable contact lenses, extended wear contacts, single vision and multifocal, colored, Scleral, and OrthoK. Dr. Bajwa, our optometrist, has extensive experience as a specialty contact lens fitter, providing advanced custom contact lenses for patients with Kerataconus, severe astigmatism, severe dry eyes, sjorgens, post LASIK complications and other conditions. He also offers cutting edge ortho k contacts used for myopia control and as a safe and non permanent LASIK alternative. You will then be fitted with a trial pair of contacts for a few days to a week before a follow-up exam to ensure correct fit and comfort. Are contact lens exams covered as part of my routine eye exam? The contact lens exam is a more detailed exam as opposed to your routine eye exam. It includes fitting your contact lenses properly and double checking your vision when wearing the contact lenses. 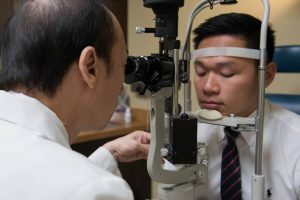 Depending on your situation, an eye doctor may provide additional services that include training and education based on the type of contacts and materials you need. Talk to your eye doctor beforehand to better understand the value of a contact lens exam and what percentage is actually covered. The staff was great and I learned a lot chatting with the doctor. I would definitely recommend this place because you can tell how much they care. Super friendly doc and staff! The staff is so friendly and nice! They’re a great friendly staff that really care! Quite an impressive and happy staff. A very pleasant experience. Dr. Kumata very professional, knowledgeable and easy to speak with. I would highly recommend. The staff is very friendly & welcoming. Dr. Bajwa is so kind. He gave a very comprehensive exam & really put me at ease. Call our office 805-642-2574 if you experience loss of vision, double vision, swelling, infection or any eye emergency, contact us immediately for guidance. We’ll help you with the best treatment to prevent complications and promote long-lasting clear eyesight. Use your best judgment on urgency, if you feel your need to find the nearest emergency room.